The Pronto series by Forno Venetzia offers an authentic Italian wood-fired pizza experience in a compact and portable footprint. The Italian-designed and engineered Pronto 500 freestanding wood-fired pizza oven is the ideal solution for outdoor kitchens with limited space. The 24 x 20-inch cooking surface allows you to cook two personal-sized pizzas at once. The fire brick hearth is lined with double-layered ceramic insulation for excellent heat-retention and superior cooking performance. The oven dome features a durable, UV-resistant powder coat finish to help prevent color fading year-round and is complemented by a signature Forno Venetzia chimney cap and oak oven door handle. A thermometer built into the oven face lets you keep track of internal oven temperatures, making it easier to learn how to adjust cooking temperatures using the oven door. The included stainless steel cart features a folding side-shelf, height-adjustable tool holder, stainless steel handle and 4 wheels for portability (2 swivel, 2 fixed). This Pronto 500 pizza oven has a red dome finish and is shipped with a fully assembled oven unit, requiring no curing before use. Some cart assembly is required. Forno Venetzia outdoor pizza ovens carry a 2-year warranty against manufacturers defects. Chips & cracks are considered normal and do not affect the performance of the oven and are not covered under warranty. Forno Venetzia builds a line of stylish pizza ovens with quality stainless steel. The first thing that caught our eye is the trendy color choices available. Depending on the oven, there are two or three color options. The dome is made from powder-coated stainless steel for excellent durability, and the cooking surface is made of refractory materials for outstanding heat retention. Authentic brick ovens utilize an in-chamber fire, which means the food is placed next to the fire in the same chamber. This style of cooking is similar to how a traditional brick oven works, and it gives your food better wood-fired flavor vs. other brands which have a separate firebox. An added bonus is the double-layered ceramic insulation which is great for heat retention, and superior cooking performance. Another great feature is the innovative design.Traditional brick-style ovens must go through a curing process before they are ready to cook, and have about an hour of pre-heat time. To solve both of these problems, Forno Venetzia came up with their innovative dome shape. With the dome being made from a copper finish, there's no curing necessary. 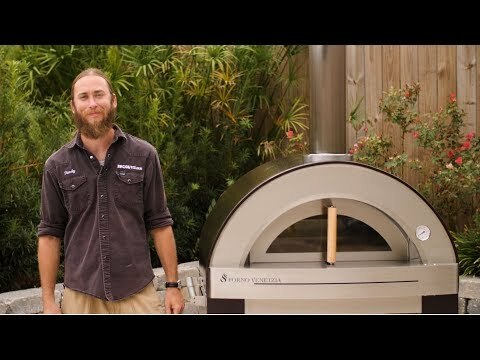 Is the Forno 500 considered commercial grade? Great question! This is considered a residential pizza oven.